Oct. 5th (sic), at the residence of Mrs. Judson, on Henry Street, by Rev. Geo. W. Henning, Mr. John W. Hillman, of New Mexico, to Miss Sadie E. Quinn, of Douglas county. 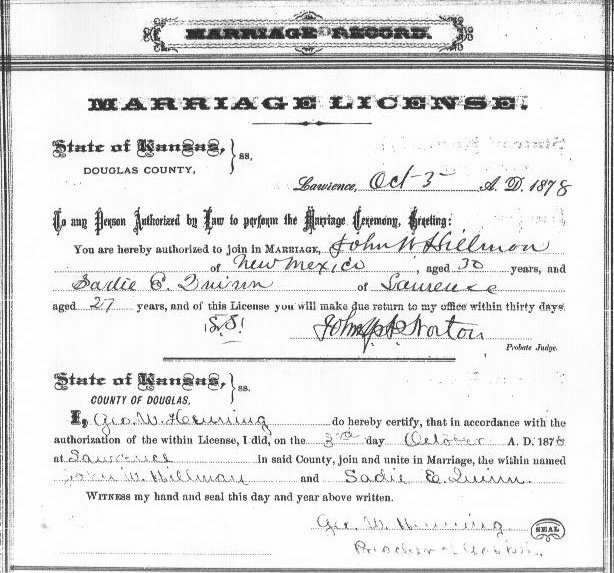 This marriage license, which is courtesy of Shirley Brier, was originally published on theJohn W. Hillman & Sadie E. Quinn Marriage License web page on theBarber County, Kansas: History & Genealogy web site by Jerry Ferrin on 17 March 2006.